Compunetix’ experience with mission voice dates back to the late 1980s, when NASA Goddard Space Flight Center used our conferencing systems to coordinate space flight operations. Since then, Compunetix has grown into the nation’s leading mission voice equipment provider. The CONTEX® Mission Voice Platform (MVP), launched in 2012, is Compunetix’ fourth generation mission voice system and our current flagship product. Nationwide, 200 MVP systems have been deployed to various government and military organizations. The MVP switch is the core of a Compunetix mission voice conferencing platform, connecting to users through voice ports (radios, phones, etc.) and Compunetix mission user consoles. The MVP is a purpose-built machine for mission voice environments, designed to meet demanding requirements for reliability, maintainability, and security. MVP switches are available in three sizes (details below). Regardless of size, every MVP switch supports 2000+ conferences. Port capacity is scalable based on the number of media blades. Every media blade has T1 and IP interfaces, allowing the MVP to connect to customer’s existing hybrid T1/IP networks and seamlessly evolve toward all-IP infrastructure. MVP switches may be deployed in black-only, red-only, or red/black configurations. The 2-SLOT MVP is 3 RU in height and features redundant AC power supplies and shelf control. The MVP 2-SLOT provides three configuration blade options: (1) non-redundant single Media (each Media blade supports up to 400+ voice ports (T1 or IP) or 90+ user consoles or any mix of the two), (2) redundant single pair Media, or (3) dual non-redundant Media with double capacity. The 6-Slot MVP switch is 5 rack units in height and holds up to 4 media blades. All components of the 6-Slot MVP are fully redundant with no single point of failure. Media blades may be configured in pairs as redundant (greater reliability) or as non-redundant (greater port capacity). A fully populated 6-Slot switch supports up to 1750+ voice ports or 400+ user consoles, or any mix of the two. 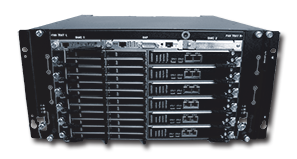 The 14-Slot MVP switch is 13 rack units in height and holds up to 12 media blades. All components of the 14-Slot MVP are fully redundant with no single point of failure. Media blades may be configured in pairs as redundant (greater reliability) or as non-redundant (greater port capacity). 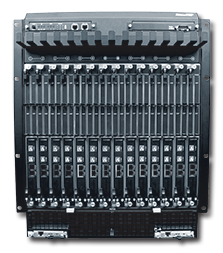 A fully populated 14-slot switch has a maximum capacity of 5000+ voice ports or 1300+ user consoles, or any mix of the two. Typical accessories include headsets, footswitches, voice recorders, and a variety of networking equipment. When purchasing directly from Compunetix, these accessories are backed by our standard warranty.